I’m Ed Smith, a California Wildfire Attorney. Wildfires have become common events for California residents. Over the past year, thousands of properties have been destroyed, residents have died or been injured, and the earth scorched. People have lost their loved ones, their pets, been evacuated from their homes, and they’ve watched as everything they worked for disappeared in an instant. Wildfires have tremendous destructive power, but they don’t start by themselves. Let’s examine Northern California wildfires, and learn what can be done to make sure that residents are compensated for their loss. For those caught in or near a wildfire, coping with the trauma of the situation starts at the moment they realize that they are in imminent danger. With hours or minutes left to them, they are forced to gather their family and what few possessions they can carry, secure their home as best they can and leave. Not only is this outside the realm of the ordinary, but it is also akin to being thrown into a war zone without warning. Once in an evacuation center, the stark reality of the situation begins to settle in. For most, they are there with a change of clothes and a few mementos, but they feel grateful to be alive. Some have done far worse. They have lost a spouse, a child or other family member, and their world has crashed in more ways than they could have imagined. Some homeowners and business owners may face the complete loss of their property when it is burned to the ground. Others may suffer extensive damage from falling ash, soot and smoke. The way these types of damages can be treated by insurance companies can differ and end up costing the homeowner or business owner. Complete destruction of a home or business: An insurance claim for total loss is necessary in these cases. However, the owner may find that the amount offered by the insurance company falls short if the property is underinsured or an investigation of the loss isn’t conducted in a timely manner. Partial destruction of a home or business: Some insurance companies may urge the owner to make repairs to a damaged structure, instead of rebuilding that portion. This can be problematic because it ignores potential underlying problems and the soot and smoke smell that can linger. Smoke, soot and ash damage: An insurer will probably want to have areas damaged by smoke, soot or ash cleaned, rather than replacing flooring, furniture or other items. The insurer may balk at replacing those items. What Steps Should I Take After the Fire? Report your loss quickly: As soon as you can after reaching safety, call your insurance agent and report the situation. In some cases, you may have a time limit to do this. It is important not to wait. Funds to survive after evacuating: You may find yourself living in an evacuation center or temporary lodgings with few personal possessions. You might need money to buy items you need every day or pay rent. Request that the insurer provide you with emergency funds. Many companies are required to do it under the policies they sell. Provide proof of loss: As with most insurance policies, you must provide evidence of what you lost. Items should be identified as best you can. Many people keep this information in a safe place or in a safety deposit box at the bank along with photos. It is helpful if you are able to use a prewritten list, but under the circumstances, you may have to rely on memory. Make it as precise as you can. Documentation: Once you are out of your home, you will quickly begin to collect receipts, estimates, doctor or emergency care invoices and proof of all living expenses, including buying clothes and paying for a hotel room or hygiene products. Amass a folder with all such documentation. It will be helpful as you begin to tabulate your loss. Securing the premises: The insurance company will want to know what you did to secure your home against property loss. This includes calling the fire department or boarding up windows. Depending on your situation, this may be helpful. 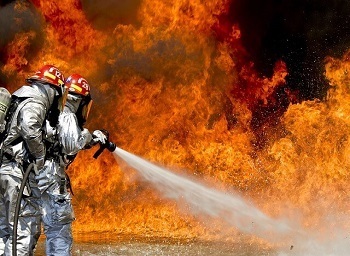 Document injuries: When faced with a wildfire, many forget about non-life-threatening injuries. This is not practical since they are expensive to treat, and some may plague you for months or years after the fire. Outside the home: Your home includes not just what is inside and the structure itself, but what is in the yard. Replanting trees and other vegetation can be costly. Include this in your final tally. Lesser claims: For some individuals, their home is not destroyed but damaged. Fire can cause smoke damage that can make a home unlivable, and it is expensive to rehabilitate the structure. Investigate the cost of removing smoke damage in your home, and accumulate estimates from reliable companies. Paying Insurance premiums: It is important to make sure your policy is up-to-date and continue making monthly payments. If you are staying at a rented home or apartment, let the insurance company know. This will ensure that this structure is covered, and the cost may be less. Don’t accept the first settlement offer: The first offer is often too low. You may not realize how much was destroyed until investigations are completed. It would seem that once you have insurance, you are covered for emergencies. After all, you paid into it for years, and the language suggests that is so. However, even if the insurer is abiding by the overall code of the insurance policy, it does not happen overnight. For some, the insurer tries to evade the promises they made with fancy language that no one understands except an attorney. As with other insurance claims, an investigator will be assigned, and it will be necessary to prove all losses. How this is done will make the difference in obtaining the compensation needed to rebuild. Having someone who can advise them and who knows how the insurance industry works can help cut through all the red tape. An experienced wildfire attorney can assess the situation, review the insurance policy, help calculate and tabulate loss and make a compelling case for full reimbursement. In many cases, the initial settlement offer will be much less than it should be. In times where everything is lost, or a person has been severely injured by fire, any offer may offer a sense of relief. However, it is unwise to accept the initial proposal for several reasons. Insurance companies are in business to make money. That means they will pay out the least they can on a claim. This is true for car insurance policies, and it is true after a fire. Taking the earliest offer is detrimental even if it seems like enough. Without itemizing your loss and tabulating what it will cost to replace it, the proposal may fall far short. Faced with the shock of loss and displacement from your home, along with worry about the future, this is a time when you don’t want to go it alone. This is where an attorney experienced in the devastation of wildfires can help. A utility company that fails to maintain electrical equipment can be held accountable. This includes power poles, switch boxes and wires. The companies are also obligated to ensure that vegetation around electrical equipment is not overgrown, causing fire hazards. A camper who allows a campfire to get out of control can be held responsible for a wildfire. Someone mowing a lawn when this activity is banned or who uses a mower that sparks can become a defendant in a lawsuit or face criminal charges. Intentional fires such as arson can spread to neighboring areas and be the source of an ensuing wildfire. 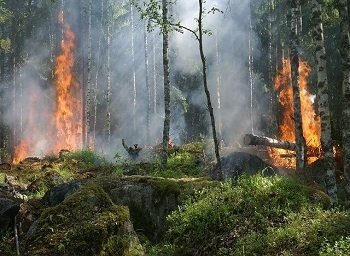 Fires caused by a lit cigarette are a common cause of wildfires. Negligence when operating a barbeque grill or fireplace can ignite a wildfire. Over 200 lawsuits have already been filed against utility companies in relation to the 2017 fires. In May 2018, Cal Fire investigators publicly reported that the company’s power lines were responsible for fires in Nevada and Butte counties. The company admitted that lawsuits were filed citing negligence or under California’s doctrine of inverse condemnation. This latter doctrine allows utility companies to be held responsible for fires caused by their equipment despite their following approved safety standards. People experience a wide range of injuries during a wildfire. These can range from debilitating burns and other serious injuries to minor ones. The majority of deaths and injuries are caused by inhalation of the toxic fumes released by a burning fire. Roughly 30 percent of fire injuries come from the flames themselves. Burn injuries are complex, and the skin is not the only organ that is damaged. For instance, the lungs can be damaged leading to respiratory arrest and failure. The Tubbs Fire: This occurred in Napa, Lake and Sonoma counties and Santa Rosa. It was the most destructive fire in the history of California until 2018. It burned 36,810 acres, and 22 people died. Approximately 5,643 structures were burned, including 2,000 homes in the city of Santa Rosa. The Nuns Fire: This fire occurred in Napa and Sonoma counties and burned 56,566 acres. About 1,000 buildings were damaged or destroyed. Atlas Fire: The Atlas Fire was in Solano and Napa counties. It burned approximately 51,057 acres. Redwood Valley Fire: This fire burned 36,573 acres, destroyed 546 buildings and damaged 44. Cherokee Fire: The Cherokee Fire was located in Butte County and burned 4,817 acres. Seven homes were destroyed or damaged. Cascade Fire: Occurring in Yuba County, it burned 9,989 acres. About 264 structures were destroyed, and 10 were damaged. McCourtney Fire: Occurring in Nevada County, this fire burned 76 acres and destroyed or damaged 15 structures. Twelve of the Wine Country Wildfires were due to power lines belonging to San Francisco’s Pacific Gas and Electric (PG&E). According to the California Department of Forestry and Fire Prevention. Two of the fires were responsible for 15 deaths. Cal Fire has said that the fires were due to state law violations by the company. The agency forwarded its information to prosecutors for evaluation. Both the Adobe and Patrick fires were started when trees fell into PG&E equipment. The company denied the charges and said they were confident that they met the state’s code for keeping electrical equipment in good working order and by pruning over 1.4 million trees annually. The company reported it spent about $198 million in managing vegetation and cutting down 236,000 trees near power lines in the year 2016. Three wildfires have already marked 2018 as a devastating fire season. After July’s high temperatures, which were the hottest in Northern California’s history along with diminished rain, the risk of fire was increased. Usually, such high temperatures are seen in September, but because of a switch in atmospheric conditions, they started early. Not only that but since nighttime temperatures did not drop substantially, the ground itself could not cool. The Carr Fire, which began on July 23 near Whiskeytown in Shasta County near Redding, burned more land than the Tubbs fire, and as of August 7, had destroyed 167,113 acres. It has already been ranked sixth of all California fires. It is believed that sparks from a vehicle that was having trouble started the fire. Seven people were killed in the blaze, including a 70-year-old woman and her two great-grandchildren. As of the latest reports, 1,077 homes, 22 businesses and 500 outbuildings were destroyed, and about 191 residences have been damaged while 26 commercial structures were destroyed or damaged. Additional buildings remain threatened by the fires, which were reported as 47 percent contained on August 7. Watch YouTube Video: "It's Not Over": California Residents Devastated by the Carr Fire. The Washington Post interviews local residents who had to evacuate their homes. Were All Residents Alerted in the Carr Fire? Due to the swiftness of the fire, alerting residents was difficult. Police canvassed the neighborhoods in the path of the fire by knocking on doors. It has been reported that not all residents were notified in Shasta County. The husband of the great-grandmother said that they were never informed of the fire. However, an official with Shasta County noted that the police saturated the area, warning residents. As of August 7, 2018, this fire that began in the Sierra National Forest on July 13. It has destroyed over 94,000 acres and has resulted in two fatalities and 11 injuries to firefighters. Two separate blazes that began close together in late July dubbed the Ranch Fire and River Fire, and collectively as the Mendocino Complex Fire, continue to threaten Lake, Colusa and Mendocino Counties. Covering roughly 454 square miles, or more than 300,000 acres, this represents the largest fire in California history. No lives have been lost, however, 75 residences are gone, along with 68 other structures. Around 11,300 structures still remain threatened by the blaze. Watch YouTube Video: Mendocino Complex Fire Continues to Threaten California. This short news clip from CNBC reports the latest on the Mendocino Complex wildfire. After losing the things you hold dear, you need the help of a seasoned California wildfire lawyer. Not only will an attorney’s input give you peace of mind, but he or she will make sure the insurance company does not try to renege on its promises. The last thing you need is to try to replace your home and necessities, and find out you do not have the funds to do it. Costs are rising at an alarming rate, and being prepared is important. If your insurer refuses to up the original offer, a wildfire compensation attorney will be able to negotiate a better price or take them to court to get it. I’m Ed Smith, a California Wildfire Lawyer. If you’ve been hurt or your home destroyed in a wildfire, an attorney's help can make the road back to a normal life easier to travel. We have the experience and drive to help you rebuild your life. Reach out to me at 916.921.6400 or (800) 404-5400. If you’d rather contact me online, go to our contact us page. I’ve been here for residents of Northern California and the surrounding areas for 36 years. I put all my energy and experience into helping them obtain the compensation they deserve when accidents or disaster strikes. I belong to the Million Dollar Advocates. This forum only allows members who have won more than $1 million for a client.